"Coalition forces have begun striking selected targets of military importance to undermine Saddam Hussein's ability to wage war," Bush said. Bush announces U.S. and coalition forces are moving against Iraq. 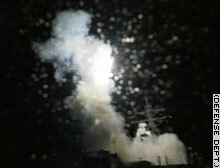 USS Donald Cook launches Tomahawk missiles from the Red Sea. White House says the 'disarmament' of Iraq has begun. WASHINGTON (CNN) -- U.S. and coalition forces launched missiles and bombs at targets in Iraq as Thursday morning dawned in Baghdad, including a "decapitation attack" aimed at Iraqi President Saddam Hussein and other top members of the country's leadership. 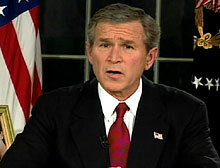 President Bush announced the start of the military campaign against Iraq shortly afterward in a televised address from the White House. Administration sources said the decision to strike came after a nearly four-hour meeting in the Oval Office in which CIA Director George Tenet and Pentagon officials told Bush they could lose the "target of opportunity" if they didn't act quickly; Bush then gave the green light. Hours later, a defiant Saddam wearing a military uniform appeared on Iraqi television to denounce the U.S.-led military campaign as "criminal" and to say his countrymen would be victorious. "We pledge that we will confront the invaders," he said, adding Iraqi resistance would cause the coalition to "lose any hope in accomplishing what they were driven to by the criminal Zionists and others with their agendas." In New York, Iraq Ambassador to the United Nations Mohammed Aldouri said, "It seems that the war of aggression against my country has started." He called the the military action "a violation of international law" and said he would ask the United Nations and the Security Council Thursday to hold allied forces accountable for the attacks on Iraq. More than 40 satellite-guided Tomahawk cruise missiles were fired from U.S. warships in the Red Sea and Persian Gulf, military officials said. F117 stealth fighters, which carry two 2,000-pound bombs apiece, also were involved in the strikes, though apparently on a target other than Saddam. Air raid sirens were heard in Baghdad at about 5:30 a.m. Thursday (9:30 p.m. Wednesday ET) about 90 minutes after the U.S. deadline for Saddam to step down or face a U.S.-led military attack. In his four-minute announcement from the Oval Office, Bush said the military campaign, supported by 35 nations, would make efforts to spare Iraqi civilians. But he made it clear the U.S. military planned to use its full might in the war. "This will not be a campaign of half measures, and we will accept no outcome except victory," he said. The United States and Britain have massed nearly 300,000 troops in the Persian Gulf region. • An early morning Iraqi radio message from a representative of Saddam Hussein's eldest son, Uday, said: "God protect us from foreign aggressors. God give us patience. God protect our leader." A cruise missile launches from the USS Donald Cook in the Red Sea. • Egyptian President Hosni Mubarak said Iraq is fully responsible for the current crisis in the Middle East, the Kuwait News Agency said. • Chaos at the Kuwait City International Airport early Thursday led officials there to close roads into the airport and allow in only employees and ticket-holders, officials said. They also said they would not let anyone else in until the situation calmed down. Video footage of the airport terminal showed it packed with people, and crowds pushed up against ticket counters. • Turkey's parliament is expected to vote Thursday on the government's request to allow U.S. warplanes to fly over Turkey. But the government will not seek a vote on a U.S. request to use Turkish bases for about 62,000 troops to move against Iraq from the north. CNN correspondents Ryan Chilcote, John King and Barbara Starr contributed to this report. For latest developments, see CNN.com's Iraq Tracker.